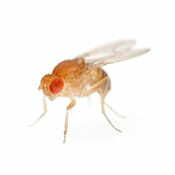 Wildtype fruit flies have brick red eyes, are yellow-brown in color, and have transverse black rings across their abdomen. They exhibit sexual dimorphism: females are about 2.5 millimeters (0.1 inches) long; males are slightly smaller and the back of their bodies is darker. Males are easily distinguished from females based on color differences, with a distinct black patch at the abdomen. With the end of the summer season, many homeowners often encounter fruit flies in and about their kitchens and near garbage storage areas. They are generally found hovering around decaying vegetation and overripe fruit. These pesky insects are often found in the kitchen, especially when vegetable or fruit materials are present. Treatment starts with a thorough inspection for the primary source of the infestation and any conducive conditions. After that recommendations are made for good sanitation practices (often involves cleaning the drains) and/or elimination of conducive conditions. Then a pesticide application maybe preformed when necessary.